The Gezhou Hydro Electric Dam (Gezhouba) is located at the lower end of the Three Gorges in the suburbs of Yichang City, Hubei Province, 38 Km from the Three Gorages Dam. This huge modern construction has become one of the important scenic spots in Yichang and over ten thousand of visitors come to visit each year. The dam is 2.3 kilometers from Nanjin pass in Xiling Gorge narrows. After passing through Nanjin, the surface of the Yangtze River is suddenly enlightened, with the surface of the river widened to over 2200 meters from original 300 meters suddenly. 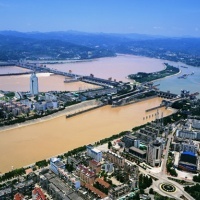 The water of the river has been divided into three streams by Gezhou Dam and Western Dam of the river, called Big River, the Second River and the Third River from right to left, and only in flood period it discharges. Gezhou Dam ydro-junction project is built here. Gezhou Dam project is mainly made of ship lock, power station, sluice gate, scouring sluice and check dam used for stopping water. 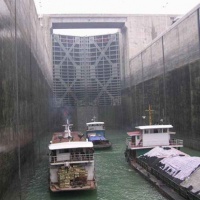 The dam is 2595 meters long and its top is 70 meters high and 30 meters in breadth. The annual one-way shipping capacity of the navigation facilities is 50 million tons and the total investment was 4.848 billion Chinese currency yuan (US$0.557 billion). The project needs to dig out 113 million cubic meters of earth and stone. The total capacity of the big dam is 1580 million cubic meters, which controls dam drainage area of 100 square kilometers. When the big dam was completed, it went through the test of the biggest flood in 1981, which got 72,000 cubic meters per second, but it turned out to be safe and sound. It can also generate electricity. It has two power stations. One is in the second river and the other in the big river, with 21 generators which produce 2,715 million kilowatt. And its generated energy annually is 14.1 billion degree and it is one of the large hydroelectric stations all over the world. After completion of the Three Gorges Dam, the annual guaranteed output of electricity from the Gezhouba Hydro Power Plant was increased by about 430,000kw. 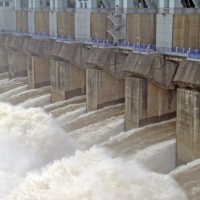 As a grand project which has attracted worldwide attention, Gezhou Dam's floodgate is of great momentum when it discharges water and the bursting mighty waves and the sound of giant underwater are amazing. The environment of the floodgate is also very beautiful. Gezhou Dam, together with Three Gorges Dam, are must-see attractions in the Yangtze River cruise.